Kyoto private Guide: The tour not spending so much! Because the tour I was supposed to be a guide was canceled due to the change of the tour schedule, I accepted another guide request at the last moment. That was this tour. Without so much time to talk about the tour plan, we met at the hotel lobby. That was their second day. The day before, they took a back-street tour using a rental bike. As they didn't go to some MUST-SEEs, I decided to see some. However, when we were at the ticket counter of Sanjusangendo temple, one of them asked me if they had to pay admissons at every temple. Admissions are required in visiting most of the famous temples and shrines. The answer was "Yes".Sometimes it is about 500 yen , sometimes 300 yen or so. Of course they said they were pleased to pay if it is worth seeing. However, whether it is worth seeing or not is up to you, isn't it? I thought about a little while, and remade the tour plan. 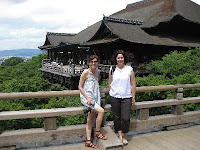 First we visited Kiyomizu temple. This temple is the most famous and popular among tourists. Of course it is worth seeing though there are always so many visitors. In addition, the admission is just 300 yen. They seemed to really enjoy the temple itself, archtecture, the view of Kyoto, a story about this temple and so on. In the precinct, there is another shrine, Jishu Shrine. The god of this shrine is said to bring good luck to those who seeking love. 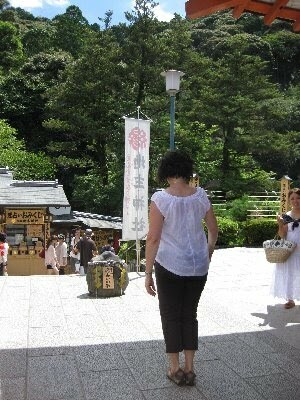 When we went up the steps in the small shrine, we saw a pair of stones called love stones. If you walk one stone to the other with your eyes closed, your love will end up successfully. One of us challenged this and she made it with some advice. In that case, her love will be achieved with some advice. I wish her luck!! 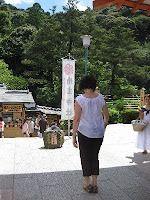 After visiting the temple, of course we enjoyed shopping along Sannneizaka, Ninaizaka walking through Ishibe kouji. These streets have not only so many souvenir shops but also very Kyoto atmosphere! And then, as they sampled some food walking along the street, and were not so hungry, we visited Chion-in temple next to Maruyama park before lunch. Buddhism in Japan has about 20 sects. Jodo-shu is one of them. 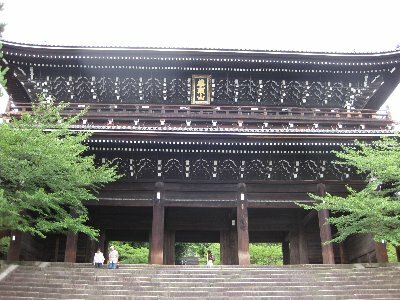 Chion-in is the head temple of Jodo-shu. Since it was amid Obon period in buddhism, from the main hall, we could hear the monks chanting a Buddhist sutra. 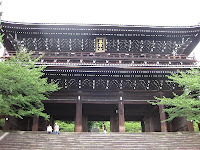 In this temple, we can enter the main hall, and sit there. We could see and listen to a Buddhist sutra there, where we were actually in solemn air. Then we went to Nishiki food market. They difinitely enjoy seeing and sampling food. One of them are eager to get one sushi bowl for making sushi rice. We went to the nearest department store, but it was very expensive, because I got one at the supermarket in a lower price. However, visiting here cost us a little.... One of them are interested in tea ceremony, but not want to pay so much, I recommended to go to Uji to have a tea ceremony. 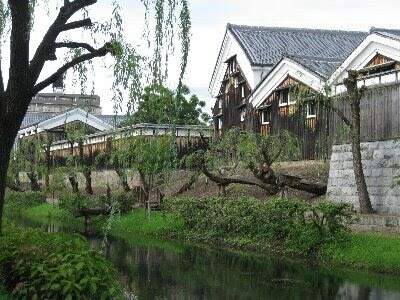 As they have JR pass, to get to Uji is free of charge and we had only to pay 500 yen. Unfortunately, the spending time at the department store forced us to give up visiting there. The tea ceremony service ends at 4 PM, and we got to Kyoto Station at 3:45. We didn't have enough time to be in time. We changed the direction and went to Fushimi. They didin't think to pay some to see inside the sake museum, instead we just walking along the canal seeing some sake storehose and visit a room exhibiting something related to sake-making. This place is run by a sake brewery company. Just walking is fully enjoyable. Due to extraordinary hot weather, we gave up going on the tour. Our expenses of this day are, bus-pass 500yen, admission 300yen, lunch. That's all!